"Your Wholesale Source for Children Clothing and Accessories"
Super Kids is a specialty retailer of children’s merchandise, sizes newborn to size 20 and has been doing business in Miami Florida since 1988. Super Kids sells high-quality, value-priced merchandise and carries many name brand and license products including licensed “Disney ”. As a growing specialty retailer of clothing and accessories for kids, Super Kids found that many customers needed an alternative, new source for buying high quality merchandise at below wholesale prices. SK Wholesale.net was created to provide such a service. SK Wholesale.net provides businesses with a selection of off price, high-quality, branded merchandise at prices that can insure great sales and higher profitable results. The company is a convenient and dependable way for any size business to grow their sales. SK Wholesale.net is dedicated to keeping our wholesale customers happy. Our Goal is to insure that you, our customer, will have great success with our Off Price Apparel and we will strive to keep you informed of all the great close-out deals that we receive. Our website www.skwholesale.net is a state of the art tool for getting important information to buyers that can not normally visit our showrooms. 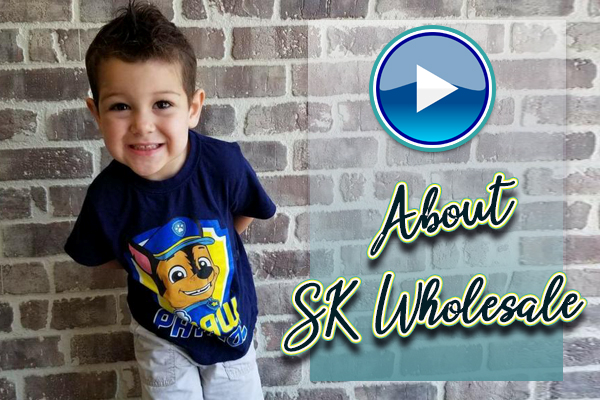 We hope you will use SK Wholesale.net is your "One Stop Wholesale Source" for all your children clothing and accessory needs.